Carefully install the NVMe cables through the center cable trough . Connect the NVMe cables to the motherboard NVMe connectors . Note - NVMe cable assembly, part number 7115195 is required to connect the motherboard NVMe connectors to the disk backplane. Note - Each NVMe cable contains a matching label that corresponds to connectors on the motherboard and the disk backplane. For example, the NVMe cable labeled A, plugs into motherboard NVMe A connector and the disk backplane NVMe A connector. Use the following table to ensure proper NVMe cable connections. Connect the NVMe cables to the disk backplane . 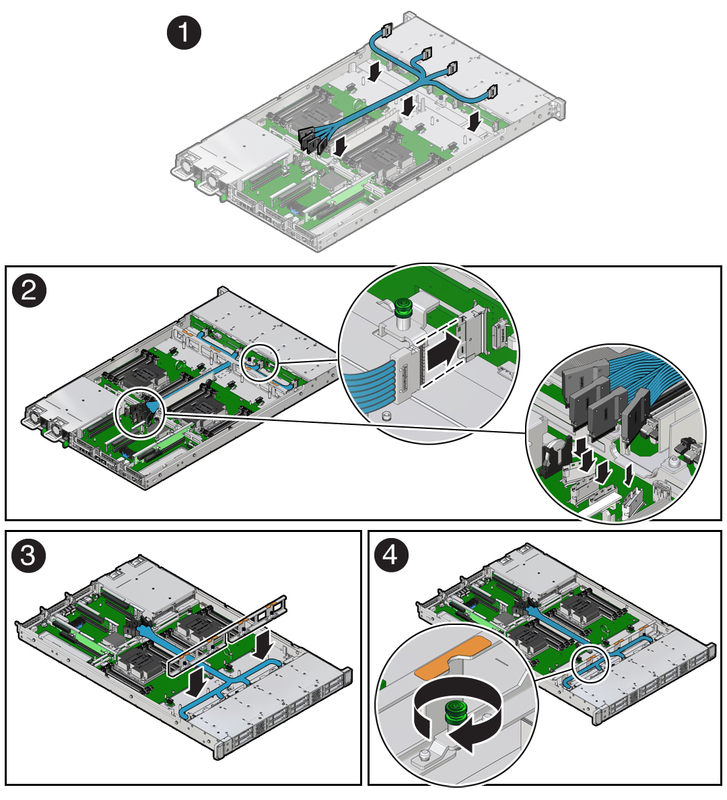 To ensure proper connections, see the NVMe cable connections table in Step 2. Install the mid-wall into the server chassis [3, 4]. Lower the mid-wall into the chassis. Ensure that the green captive screws are aligned with the screw holes on the bottom of the chassis. Using a Torx T15 screwdriver, tighten the four green captive screws to secure the mid-wall to the server chassis. Install all of the server fan modules.